The Boxwood Arts committee has released conceptual plans and illustrations for the proposed theater and cultural center it envisions at the Boxwood Hall property. 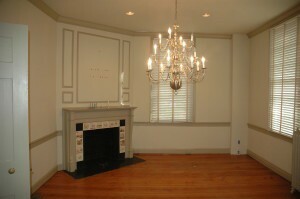 The property would focus on preservation as well as cultivation of the arts. Despite the release of concepts, Boxwood Arts, as well as borough commissioners, wanted to make the public is aware these are just concepts. The committee is not ready to move forward, and this is not “a done deal.” No total cost was given. “It is still in the conceptual phase. We have a preliminary site plan. We need to continue to find operating partners and donors, as well as work with the town and preservationists to make sure all of the pieces are together,” Stavetski said. “I think that there are people out there who think this is a done deal, and it is far from it. They will have to go through the full process,” Commissioner John Moscatelli said at last week’s commissioners meeting. The full process Moscatelli was speaking of includes going through the various boards of the borough, such as the Historic Preservation Committee, the Zoning Board and the Planning Board, as well as allowing time for public comment. Moscatelli said the property is zoned R2 with an R0 overlay, a single-family residence with office district overlay, so an arts center is not a complying use. “There is plenty of work to be done. We are in the conceptual phase; (we are) getting the material we need to go before the boards,” Stavetski said. Commissioners said they will work on a public statement about the options of the Boxwood Hall property, as per resident Kim Custer’s request during public comment at the meeting, saying there is some information that could be misleading. 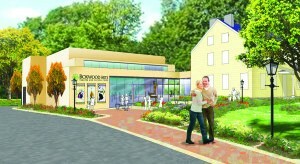 • Boxwood Hall would become gallery space for the Markeim Arts Center and administrative offices. The Sun was given the opportunity to tour the inside of the building. Filled with spacious rooms and hallways often connecting each room to the other, the committee showed examples of how the space could be used for exhibitions. Historic Boxwood Hall, built as a residence by John Estaugh Hopkins in 1799, would be completely renovated, and parts will be restored in compliance with preservation guidelines. The executive committee plans to retain a noted historic preservation architect to assist with these aspects of the project. The building will be retrofitted with energy-efficient lighting and modern heating and cooling systems. 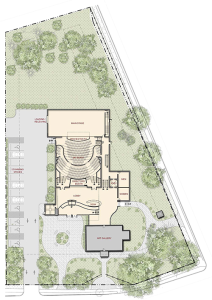 • A 365-seat theater would be a first-class venue for Haddonfield Plays & Players, speaker series, musical performances, dance, film and other cultural events. The theater would be a new building behind the house, including orchestra, mezzanine and balcony seating. The stage will feature an orchestra pit, theater rigging and a projection system for film screening. The house behind Boxwood Hall would come down to put in the new arts center. Stavetski said the house is not historical, and the committee has been in touch with those renting the house from the borough, and they would be given plenty of time to relocate. A glass-walled lobby between the art gallery and the theater will create an open and airy connection, filled with natural light and affording views of the grounds beyond. • Below the theater would be a 4,000-square-foot competition-quality dance floor with 16-foot ceilings for Dance Haddonfield and a catering kitchen, as well as a social space with seating. The space would serve many community uses. • The woods at the rear of the property would be conserved and kept accessible to the public for cultural and educational purposes. Multiple professionals have been brought on to the project, including Anthony Iovino of Acari + Iovino Architects, who designed the recent renovations at the library; Alysse Einbender, a landscape architect and design consultant who serves on the Advisory Board for Accessibility of MossRehab; and Graham Alexander, a Broadway performer, recording artist and sound designer to ensure Boxwood Arts has superior technical and acoustical qualities. In developing the concept for the campus, the committee was guided by Mitch Gorshin, a former Disney Imagineer who now owns Gorshin Trading Post in Haddonfield. Gorshin has an extensive national portfolio that includes creative oversight for the National Liberty Museum in Philadelphia, Marriott and Revel Casino in Atlantic City.